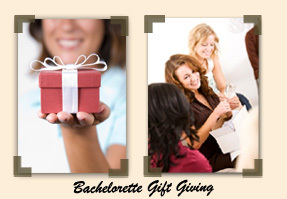 If money is tight, we can help make the bachelorette party right, with low cost gift ideas. Many bachelorettes have written in, wondering what the bacheloretiquette is on whether or not it is traditional to give a gift at bachelorette parties. Let's face it, if you are invited to the bachelorette party, you may be in the wedding which means that you are responsible for a wedding gift, a bridesmaid dress, possible travel plans, a bridal shower gift, and the bachelorette party. Where is that money tree when you need it! There is a difference between gifts and favors for bachelorette parties. Bachelorette party favors are the gag gift items that are traditional to give at bachelorette parties while a bachelorette party gift is usually not something traditional but appreciated. Bachelorette favors can be in the form of a novelty item such as willie straw, a blow up doll or even small bachelorette favors and can be given as a group. Bachelorette party gifts are more usually more personalized from an individual bachelorette and can also be for the honeymoon. Either gift or favor do not have to be an expensive purchase. Get all the girls emails and phone numbers early. Send out an email or have a conference call with everyone who can join going over the funds. Review a bachelorette party website that offers the lowest prices and best selection with our pick bachelorettepartyfun.com. Choose a dollar amount that everyone is comfortable with in giving for bachleorette supplies. Give everyone a date to get the amount in by giving your address or having a pre-party meeting. Collect the funds and then let other bachelorettes be in on the purchase of what the best bachelorette party supplies include. Shop the latest styles for Bachelorette invitations. Make your choice for bachelorette party invitations and prepare them for mailing. Give yourself enough time for the bachelorette supplies to arrive (at least one to two weeks) which will also give you free freight and no sales tax savings. Make sure to place the bachelorette supplies somewhere so you remember to bring them on the last night out. There have been bachelorettes who have forgotten them! Anyone who has not paid on time, send them a reminder and let them know you want to collect the money prior to the last night out. If you still have girls that have not paid when at the bachelorette party, make one more public notice prior to going out. If someone still has not paid, email them after the party asking them how helpful it would be for them to pay. More of your friends will show-up at your bachelorette party when you send your invitations out early. You know your friend who is getting married so make sure to cater the gift to her. Don't get her something totally embarrassing if she does not like to be embarrassed. It is also helpful not to waste money on a gift she will never use or that is not functional at the bachelorette party. The bachelorette gift or bachelorette supply does not have to be expensive and can be more of a thoughtful gift that she will appreciate. Don't feel pressured to have to spend money. Your friend will be happy you are there and present for her last night out which will mean the most to her. There are a lot of bachelorette supplies and gifts that you can find on the market. Pay attention to the season of the bachelorette party in what you purchase. You don't want to get bachelorette squirt guns if it is in the cold of winter and you don't want to get bachelorette leis if you are having a ski party. It is also worth mentioning to dress the part and make sure to plan ahead for what attire you may need or may need to change into if going to different venues. There is nothing more of a party foul than to start setting up the bachelorette party when the bride-to-be is already present. Make sure to get a diva crew to help set up the bachelorette favors or wrap the bachelorette gifts prior to the Last Night Out. Ask the other bachelorettes early on who wants to help out and make sure to choose a convenient date and time to set up and wrap. One of the most important jobs for a friend of the bride-to-be is the bachelorette gift watcher and keeper. This is a person who will not become too drunk and will be responsible for making sure all bachelorette supplies are accounted for during the nights festivities. There is not as much of a worry for the bachelorette party favors as the bachelorette gifts. For instance, if the bachelorette gets some great bachelorette gifts and you are at a dance club, you don't want to come back to everything stolen. Either take on the responsibility or assign a few girls to watch the bachelorette's belongings. At the end of the bachelorette party, many of the girls may want to take some of the bachelorette supplies that are left. It is always nice to get a few of the cheaper bachelorette favors that everyone can take. However, there may be some bachelorette supplies that someone wants to take home. It is important to be fair about it and see who wants the items. Of course it is the bachelorette's choice first as it is her party but then you can divide up the rest of the bachelorette supplies by who paid for them, who chipped in the most, and then flip a coin for the rest. Don't ruin the last night out at the end with bachelorette drama. Keep it fun and light. It is growing more and more popular to give a bachelorette gift card to the bride-to-be's favorite spa or store. Giving a bachelorette gift this way is great since it is easy to carry, will be used and appreciated and can be as much as you want or can afford to give. The bachelorette will appreciate it! 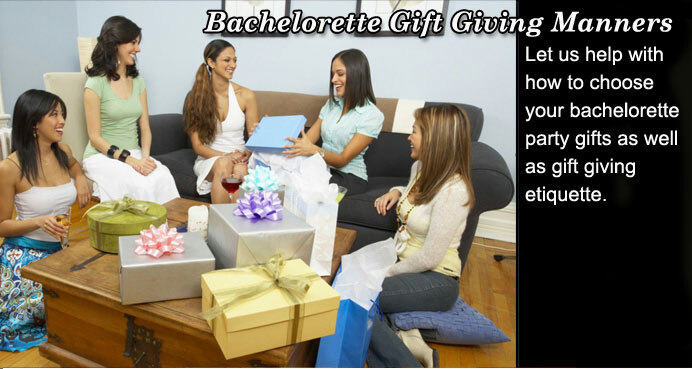 We hope that the gift giving manners for bachelorette parties was helpful and would love to hear your feedback. Please email us at bachelorette@bacheloretteparties101.com and we may add your ideas in helpingother bachelorette party planners as well.